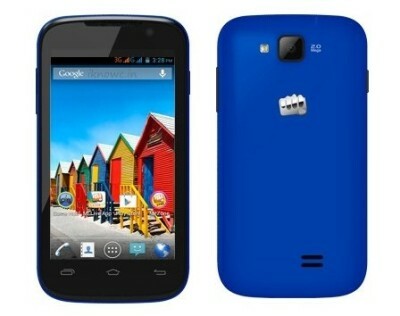 Micromax A63 Canvas Fun, the latest device from the company with entry level specifications launched. It is Dual Core phone with MT6572 chipset clocked at1.3GHZ frequency. There are several handsets in the market with similar specs. The price of the device would be around RS 6,000. The company will soon launch data cards, android and windows smartphone with 4G LTE support. The Canvas A63 runs on Android 4.4.2 jelly bean operating system. It comes with 4-inch WVGA resolution capacitive touch screen, 4GB internal storage and 512MB of RAM. The memory can be expandable up to 32GB with the use of Micro SD card. 1GB internal storage is assigned for apps installation and 1GB as mass storage (user available). The Micromax Canvas Fun A63 has 2MP rear camera with flash and a VGA front facing camera. Although the good thing is that , it can record 1280x720p HD videos. 1500mAh battery is there to power the smartphone, that offers 135hours of standby and 4.5hours of talk time. It does supports Dual SIM ( GSM + GSM). The Micromax Canvas A63 Fun also features 3G, 2G, WiFi, Bluetooth v2.0, GPS and micro USB port connectivity. It would compete with Micromax A74 Canvas FUN , Spice Mi-436 and Intex Y2 and Intex X4. The Mi 436 has better features and specs than all above as it supports 3G on both the SIM card. The handset will be soon available in the market and online retailers as well.